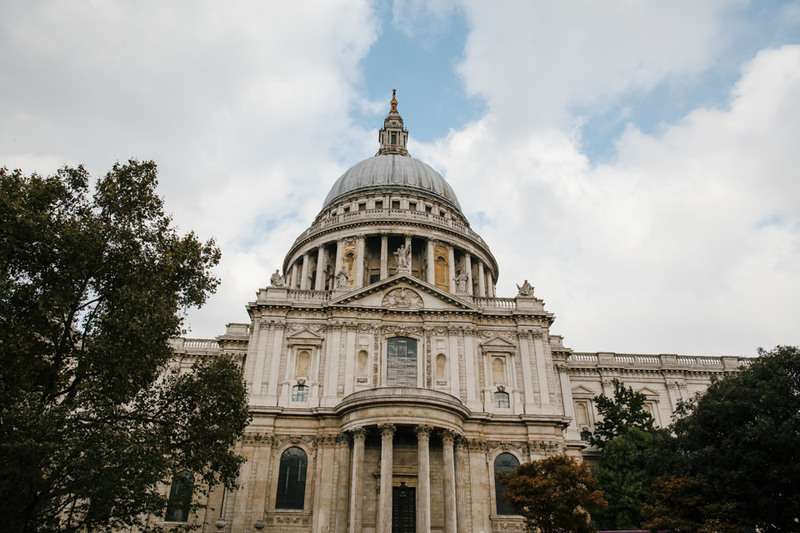 There is no denying the epic-ness of this city wedding, I mean, our gorgeous couple got married in St Paul’s Cathedral for goodness sake, yep you heard me right, St Paul’s Cathedral. Come on it can’t get much more immense than that! It’s incredibly elegant and stylish in every way with Bride Rebecca wearing an absolutely stunning Martina Liana gown with the prettiest lace sleeves. 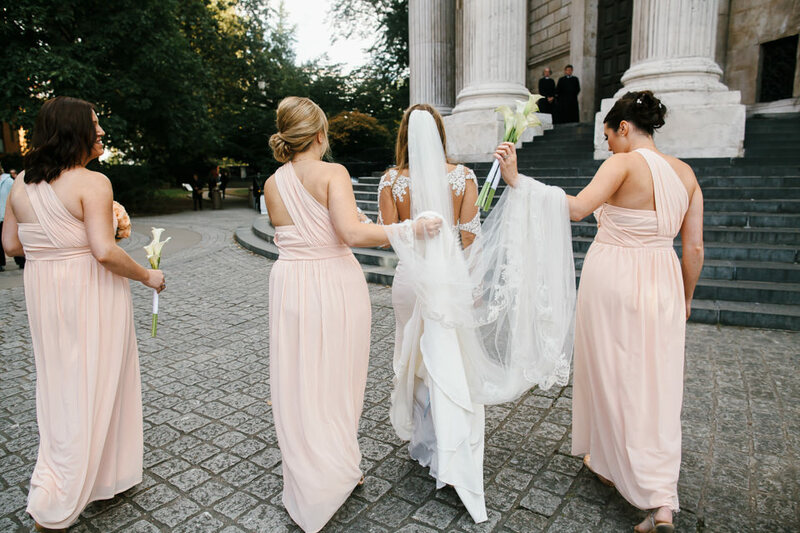 Her classic peach rose bouquet matches the bridesmaids ASOS gowns perfectly and adds a subtle pop of colour to the sophisticated surroundings, and the images captured by Chris Barber Photography of the couple amongst the Cathedral’s historic architecture and London’s modern skyline are simply breathtaking. 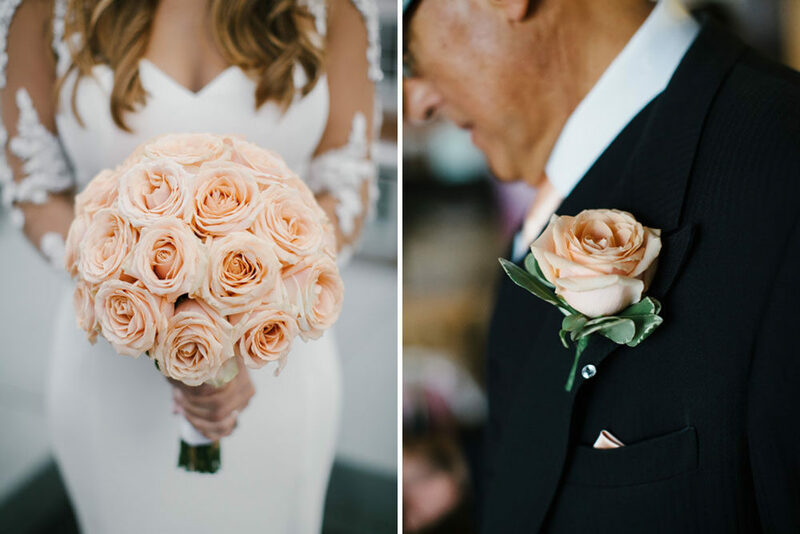 Serious peach perfection and wedding goals right here folks! 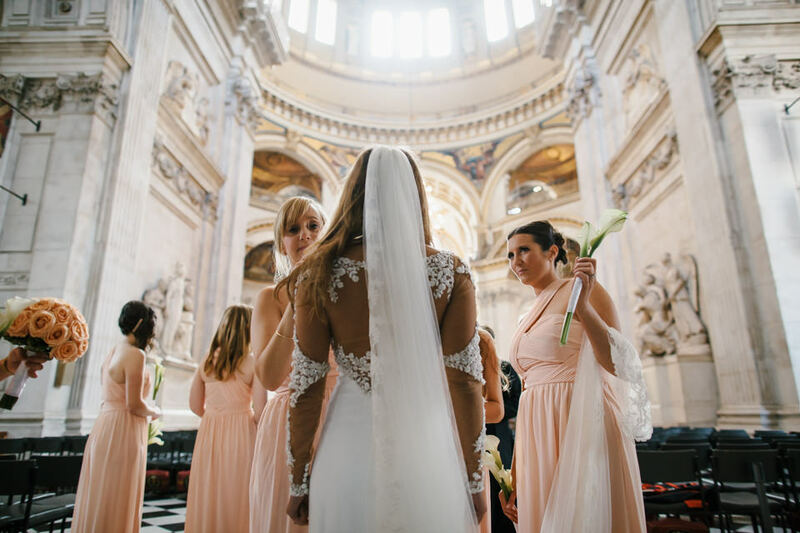 Rebecca the Bride: Although I am quite a girly girl, I never really dreamed of my wedding day from when I was little or had it planned to the exact detail. So when Joe’s mum announced she had been awarded an OBE, I was surprised that my first thought (after being extremely proud) was “WE CAN GET MARRIED IN ST PAUL’S CATHEDRAL!” (We weren’t even engaged at the time!). After nine years of being together Joe proposed in a beautiful vineyard in Sicily, and after three months of celebrating, we calmed down and started to plan the big day. 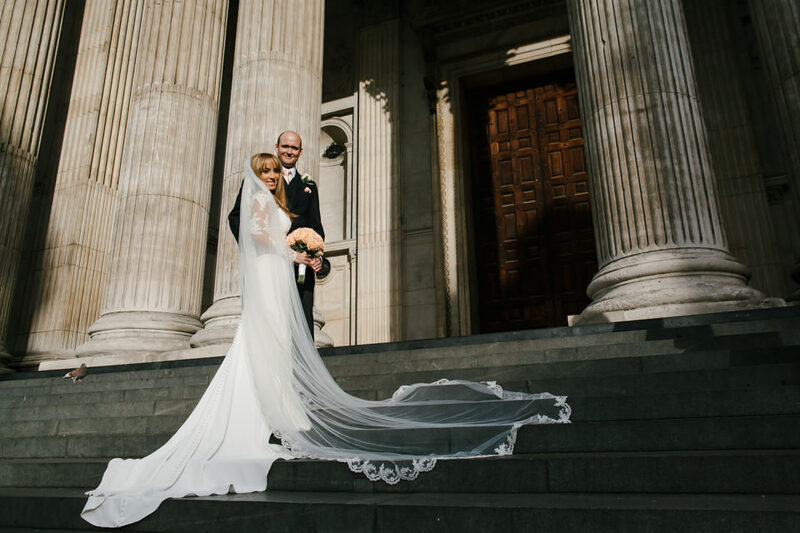 We applied to get married at St Paul’s Cathedral but because we were slow off the mark they hardly had any dates left so we began to give up on the idea…until they came back with the date of the 15th October- my birthday. I have always loved my birthday so what better way to spend it than with everyone I love! Next was to choose a reception venue. I had remembered attending an event at Plaisterers’ Hall and being in awe of the beautiful building and amazing food. We booked to go and see it and within 5 minutes we knew we wanted Katya and Create Food to cater our reception! We had the big things done and were all set…or so we thought…..6 months before the wedding we received the bad news that a water pipe had burst flooding Plaisterer’s and we would therefore have to find another venue. I had two choices- I could either freak out or I could think rationally and get the ball rolling and look for another venue. 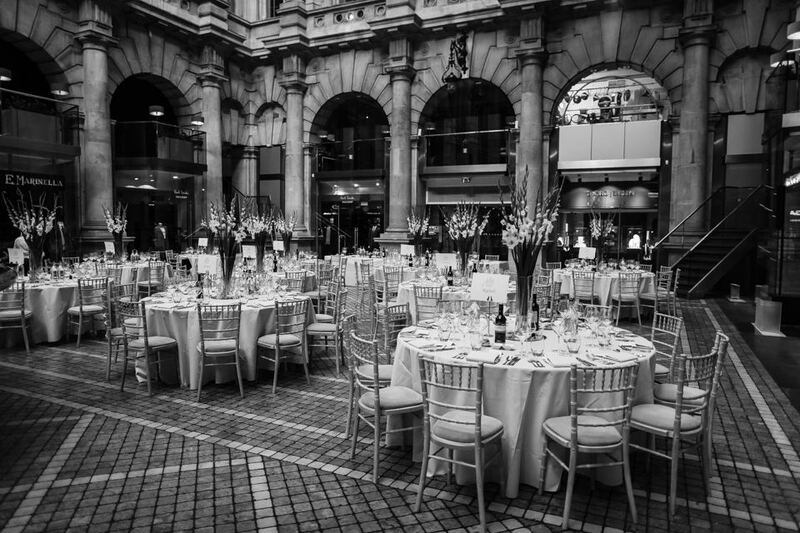 I knew we wanted to stick with Create Food and Katya was a godsend in helping us look for a new venue – within 48 hours we had it: The Royal Exchange! Here comes my biggest tip- GET WEDDING INSURANCE! Chances are you won’t need it but I don’t know what we would have done without it. Because the ceremony was at St Paul’s we were quite restricted in terms of music and readings, but we were lucky to be able to find songs we loved. I walked down the aisle to Cavalleria Rusticana, which is Joe’s favourite classical song and had a great impact as I entered the Cathedral. My sister/bridesmaid Francesca and Joe’s dad read from Ernest Hemmingway and the Song of Solomon (A love poem between two lovers). The ceremony ended with a rousing rendition of Jerusalem, sung at the top of our voices- a moment I will never forget! 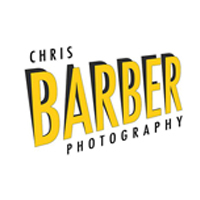 We found the truly amazing Chris Barber when a wedding he photographed popped up on RMW. We just loved the candid documentary style of his photography, but he also did a great job of the portrait style shots as requested by the parents. Even though he is extremely busy he was always very responsive to emails, and believe me I sent a lot of questions! The finished photos speak for themselves! It was a pleasure to have him at our wedding; he kept us all calm and managed to capture the wonderful moments of the day perfectly! Our extremely talented family friend Lynn was there to capture our wedding documentary style! She filmed from the moment we woke up to the moment we dropped at the end of the night. Every time I watch the video I feel like I am back at the wedding and it allowed us all to see the bits we didn’t see on the day (and it exposed a certain best man was rather hungover!) We will treasure the video as an amazing memento of a fantastic day. Within a few days of searching online for my dress, I knew I wanted one by Australian designer Martina Liana and was ecstatic to learn that Love Bridal in Crystal Palace was holding a trunk sale! I didn’t expect to get my dress so quickly but when I put it on and my best friend burst into tears, I knew it was the one I had to get. Max and the team helped me bespoke the dress by adding tattoo lace sleeves and I could not have been happier with the final creation. 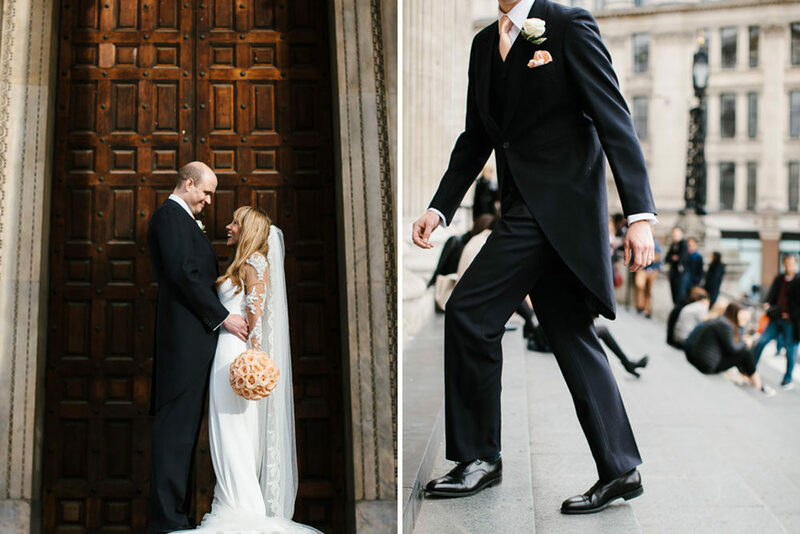 I was lucky enough to have two pairs of wedding shoes; Jimmy Choos for the evening and Kurt Geigers to walk down the aisle (the KGs were meant to be easier to walk in, but turned out to be just as high!) My veil was my “something borrowed” from my best friend; after her wedding in July she handed it to me, like she was handing over the wedding baton- there were tears! Because the sleeves and neckline of my dress were so ornate, I did not need to wear jewelery, however Joe bought me some beautiful Monica Vinader earrings for my birthday, that just popped out from beneath my hair. They also acted as my something blue! 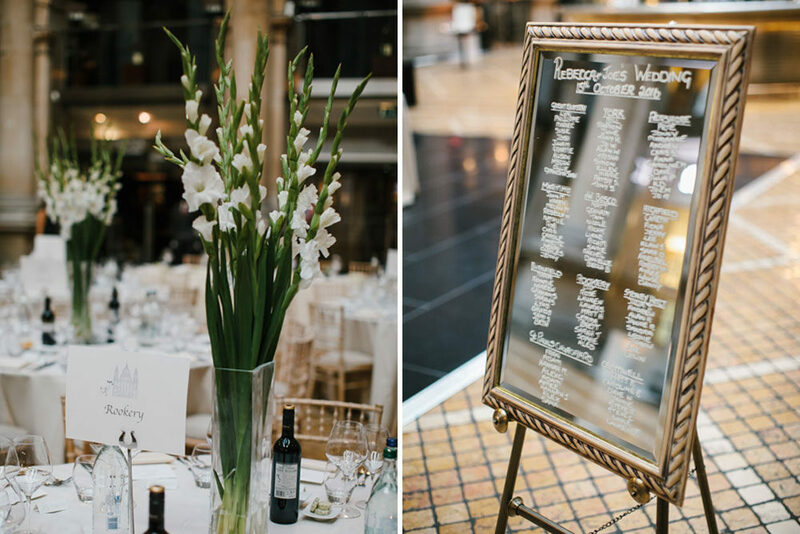 I was lucky having two such beautiful venues that I was able to keep the extra décor to a minimum. The original plan was to buy the flowers from Columbia Road Flower Market, however it turns out my floristry skills are not up to scratch – this is where my mother in law came in. Joe’s side of the family are from the East End of London and we used the family florist Bonnie’s Blooms to create the beautiful flowers. They were great and had a better idea of what I wanted than I did! I had a big round bouquet of pale peach roses which matched the buttonholes and ties of the boys. The bridesmaids had simple yet beautiful bunches of Calla lilies and on the dinner tables we had vases of gladioli and tea lights. Wow the cake- it looked amazing and tasted fantastic! Family friend Annette designed the stunning butter cream and marshmallow icing fondant fancy cake (yes I did get the fondant fancy idea from RMW). It was absolutely delicious! Katya and Create Food were able to accommodate our every wish and the food was some of the most spectacular I have ever had. We also had free flowing beer, wine and prosecco and had a signature cocktail- Mojitos all round! From the moment we met our wedding coordinator we knew we had chosen the perfect company to cater our wedding. Create were extremely well organised, responsive to emails, really took the time to understand what we wanted from our big day and above all very patient with a demanding bride. On the day it was like a dream! Walking into the venue and seeing the perfectly arranged tables took my breath away and was exactly how I had pictured my wedding. I knew the service would be great but it exceeded my expectations! As soon as the guests arrived they were served the most exquisite seasonal canapes and they never allowed glasses of prosecco to be less than half full! The food service ran perfectly to time with the service staff entering the room down the stairs in unison and serving all the guests at the same time in a service that would rival the best restaurants in London. The whole operation was slick and professional and three months on I still have guests raving about how fantastic the day was. Dessert- white chocolate and vanilla and cadamon tart, tangerine curd, white chocolate shavings. My whole wardrobe is from ASOS so it made sense that the beautiful bridesmaid dresses came from there too. The colour and the shape of the dresses looked perfect on all of the bridesmaids and toned in so well with my dress and the flowers. As bridesmaids gifts my mum helped me choose navy pashminas to match the boy’s suits (there was a risk of it being chilly in October), as well as rose gold chokers (from Accessorize) that matched the dresses perfectly. Joe is rather tall so we needed to get the suits from a tailor to ensure the trousers were long enough. We selected local tailor Anthony’s in Billericay (Essex), who provided us with the lovely navy three piece tailcoats for the lads. We wanted the wedding stationary to have a St Paul’s theme and so we enlisted my sister’s friend, the very creative (and very patient) Holly Ovenden to design the bespoke stationery for us. We danced, oh boy did we dance to the spectacular Blue Lion Band. This was Joe’s main task due to his love of music, and he didn’t disappoint! He and good friend Chris went to see the band perform a showcase and he booked them there and then. It was really easy to keep in touch with the band and they provide a handy personal web page for us to share music ideas with them. We had a call with the manager of the band beforehand so we could discuss the final details of timings. We have had so many people say they were the best band they had seen and people didn’t want to leave the dance floor! I would highly recommend them. I wouldn’t have had anyone do my hair but my amazing hairdresser Caroline! Leading up to the wedding she helped me perfect the colour and we decided hair down would make me feel more relaxed on the day. Being a good friend, Caroline was invited to the wedding and even though she was there as a guest she ensured I never had a hair out of place! What a wedding! 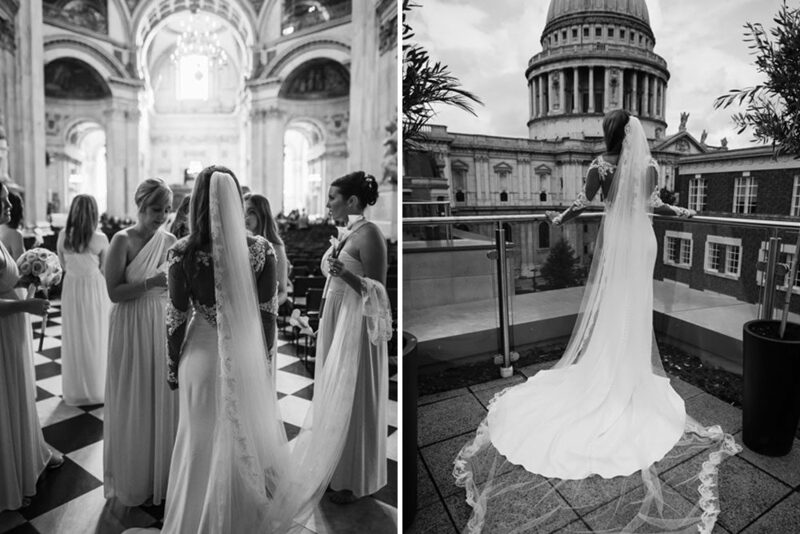 Would love to shoot at St Paul’s for a wedding – You produced some great shots Chris – The mono shots were wonderful and this really had a feeling of a city wedding – Brilliant!